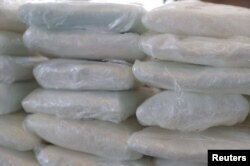 Packets of fentanyl mostly in powder form and methamphetamine, which U.S. Customs and Border Protection say they seized from a truck crossing into Arizona from Mexico, is on display during a news conference at the Port of Nogales, Arizona, Jan. 31, 2019. Most of the seized fentanyl, with an overall street value of about $3.5 million, was in white powder form, but about 2 pounds of it (1 kilogram) was contained in pills. Agents also seized nearly 395 pounds (179 kilograms) of methamphetamine with a street value of $1.18 million, Humphries said. Mexican traffickers have been increasingly smuggling the drug into the United States, mostly hidden in passenger vehicles and tractor-trailers through ports of entry in the Nogales, Arizona, and San Diego areas. Doug Coleman, the DEA’s special agent for the Phoenix division, expressed admiration for size of the recent bust, emphasizing that it was not the product of any intelligence from his agency but rather “pure, old fashioned police work” by the agent who pulled the truck over. A chemical specialist in a protective suit shows pills seized at a clandestine drug processing laboratory of fentanyl in Mexico City. 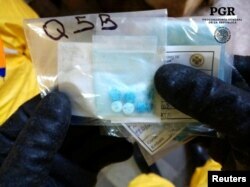 Similar pills were seized at the U.S. border Thursday by border protection officers. U.S. law enforcement officials say the illicit version of the painkiller is now seen mostly as a white powder that can be mixed with heroin, as well as blue pills that are counterfeits of prescription drugs like oxycodone.